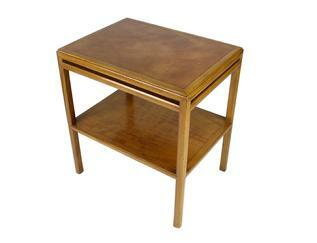 Lamp table in mahogany with blind tooled inset leather top. Lower shelf with additional upper rail. A handsome lamp table designed by Gump’s, the famous San Francisco high end department store, and produced by important Chicago furniture manufacturer Johan Tapp, probably in the late 1950’s. The horizontal upper stretcher detail distinguishes the table nicely. The leather top is clearly hand padded for color, showing a rich variation. The table carries the luxury feel for which both Gump’s and Tapp were famous. Very good condition. Light cracklature to leather top and wear consistent to a 60 year old table. A nice original table. Johan Tapp was a Dutch born designer who set up a cabinet making business in Chicago. His work was largely premium bespoke pieces for a very A-list clientele. After the war, the business expanded into making limited run items for specialty premium sellers, including this work for Gump’s.